A mirror shows an upright image twice as large as the object when the object is 10 cm away from the mirror. What is the focal length of the mirror? This is College Physics Answers with Shaun Dychko. We're going to use the thin lens equation, which also applies to mirrors, to figure out the focal length but in order to do that, we need to know what the image distance is. 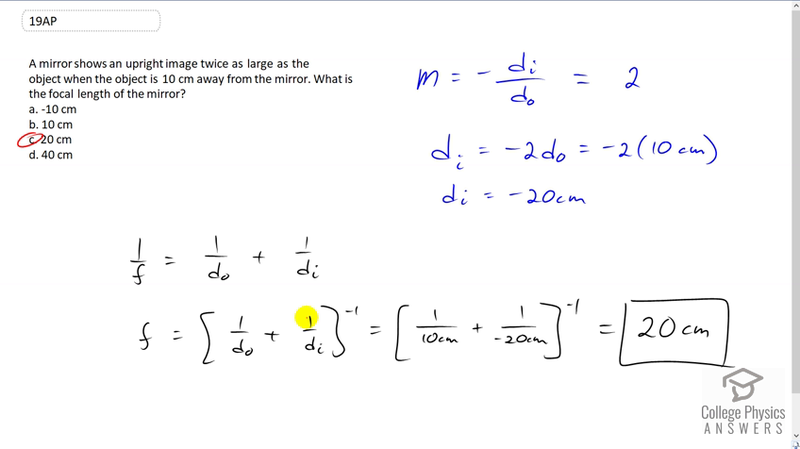 So, we know that the object distance is and we know that the magnification is, so the magnification is two because the image is twice as large and since it's upright, that's a positive two. So, the magnification is negative image distance divided by object distance, and this equals positive two in this case. So, we multiply both sides by object distance times the negative and we get image distance then is negative two times object distance. So, that's negative two times ten centimeters. That gives an image distance of negative 20 centimeters. So, from this thin lens equation, we can raise both sides to the exponent negative one and we get the focal length then is one over object distance plus one over image distance to the negative one. So, that's one over ten centimeters plus one over negative 20 centimeters to the negative one, which gives a focal length of 20 centimeters.